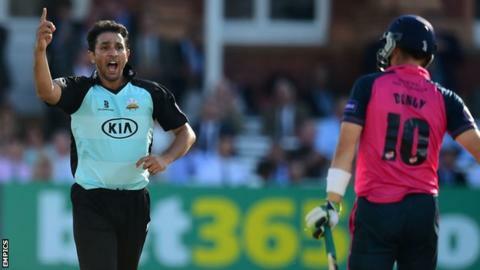 Surrey have re-signed all-rounder Azhar Mahmood to play in the 2015 T20 Blast. The 39-year-old former Pakistan international played for Surrey between 2002 and 2007 and had one-day spells at the Oval in 2013 and 2014. Mahmood was an ever-present for Surrey in T20 competition last season, scoring 208 runs at an average of 23.11 and taking 17 wickets. "To have his wealth of experience and skill levels is a huge bonus," said director of cricket Alec Stewart. Mahmood, who became a British citizen in 2011, is the fifth-highest wicket taker in the shortest format of the game. He has taken 241 wickets in 213 T20 appearances, having played in Australia, South Africa, India, Pakistan, Sri Lanka, New Zealand, Bangladesh and the Caribbean.